CK here with some breaking news. This may sound like a headline from The Enquirer but it’s true. Over 50% of all U.S. cats and dogs are overweight; and, in most cases, their pet parents don’t care! It’s an outrage! That’s what it is. 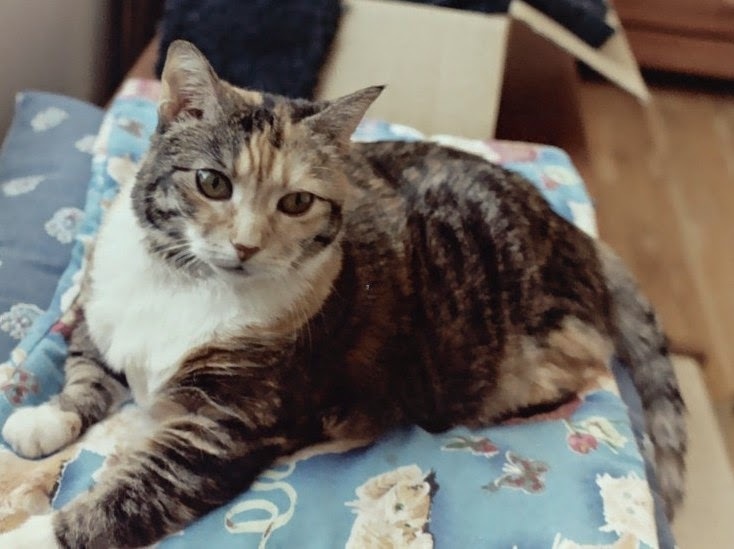 A study by the Banfield Pet Hospital State of Pet Health 2012 says that over the past five years the number of overweight cats has increased by 90%! Tell me that’s not an epidemic. One common misconception I actually heard during a keynote at Blogpaws last year was that heavy humans tend to have heavy pets. *GONG* Wrong-o! Autumn sure is cute but they don’t call her “Plumpy” for nothing. I’ve been telling you about Chizzy and plumpy Autumn, Gramma’s cats. Gramma was a petite woman, never weighing more than 115 lbs. Her cats weren’t. File that misconception in the circular file. Another misconception is that flabby tabbies are cute. There’s nothing cute about a grossly overweight cat. Yes, we all laugh when we see internet cats that have a wide girth. A lot of dumb people also laugh when they see overweight humans, especially kids. These kids are laughed at, picked on and bullied—unless they’re on the football team and can crush the bullies. Do you want your cat laughed at and bullied? I didn’t think so. Misconception number three is humans think the way to Fido or CK’s heart is through their stomachs. They rationalize the best way they can show their love is by feeding us food and treats on demand. It’s easier than watching us beg. Some humans don’t know that you can also show love by giving us your time. Cats love to play. There’s nothing better than playtime with our humans with a wand toy or laser. We may love a human who stuffs food in our faces but we also see them as someone we can control. 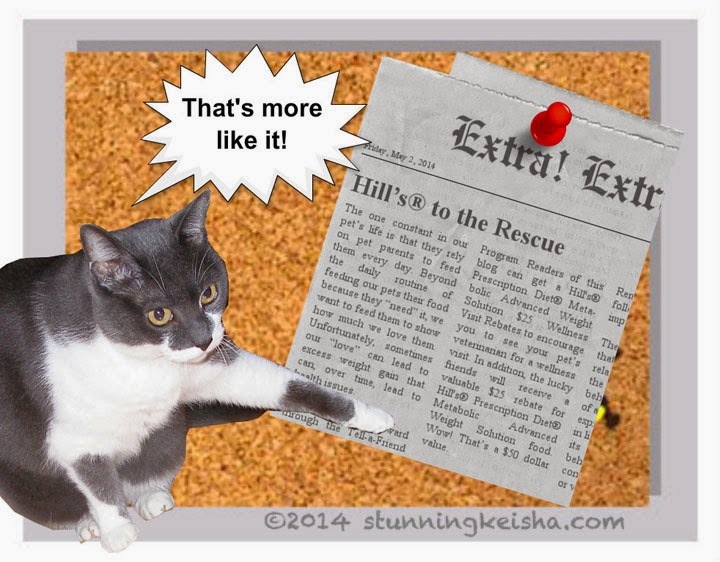 Bulletin board items courtesy of Hill’s Pet Nutrition. What to do when the strategy backfires? 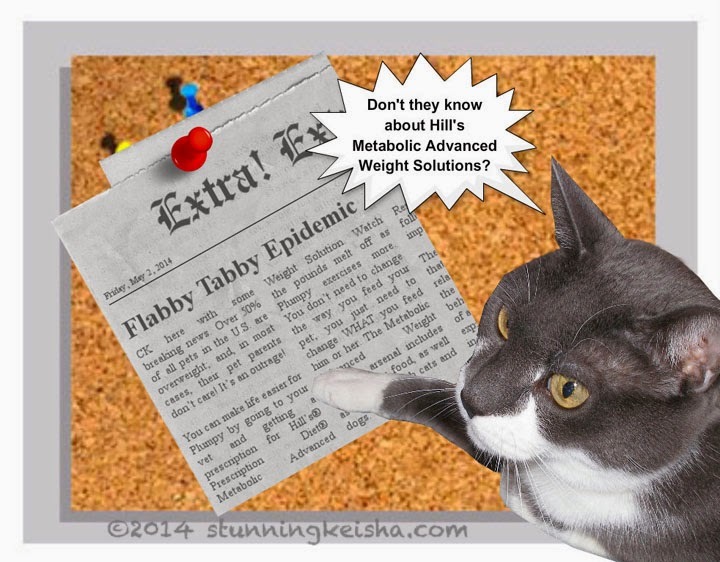 Once humans realize their fur child is overweight, they have to rethink their strategy. Suddenly portions get cut and we may not get treats at all! We’re angry cos we thought we had them trained. They claim they still love us but we don’t see it. I have a solution! Cats need exercise like wand toys. You can make life easier for Plumpy by going to your vet and getting a prescription for Hill’s® Prescription Diet® Metabolic Advanced Weight Solution. Watch the pounds melt off as Plumpy exercises more. You don’t need to change the way you feed your pet; you just need to change WHAT you feed him or her. What human wouldn’t want to feed their dog or cat a food that’s beneficial to their well being? The Metabolic Advanced Weight Solution arsenal includes wet food and dry kibble, and even treats, for both cats and dogs. 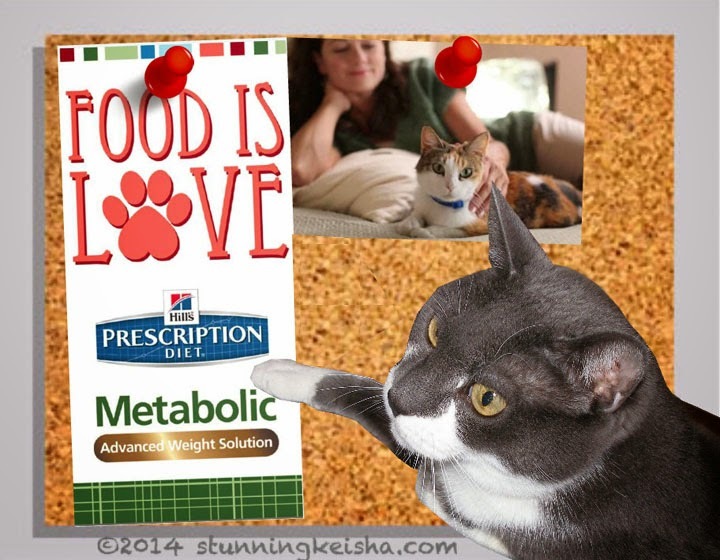 Unless your pet is smart like me, they won’t even realize their new good-tasting food is diet food. You don’t have to withhold food/love, you’re just redefining that love. That redefined love may just help your fur child live a longer and healthier life. Keep checking back here and I’ll tell you how to get one of 500 rebates via Hill’s to encourage humans to take their pets to the veterinarian for a wellness visit. To claim your rebate, please fill out this form. Details can be found by biggifying the image below. Extraordinary nutrition + redefined love = YOUR PET AT THEIR VERY BEST. Like you, darling, I am reasonably svelte. But maybe my Human should be eating that stuff, MOL! XOXOXOX I hope you are beginning to feel good again, CK, and hope TW's eye is recuperating well. Purrs to all. Good point to avoid the problem angry felines without treats. 90% sure is a big increase... great post CK! Yikes we try and avoid having to do the D thing. So far so good. Hope you are better CK. We have been thinking healing vibes for you. Have a fabulous Friday. So many people don't realize that their pets are overweight and that they *can* lose the weight and live better lives. It's an important message for their health and longevity. 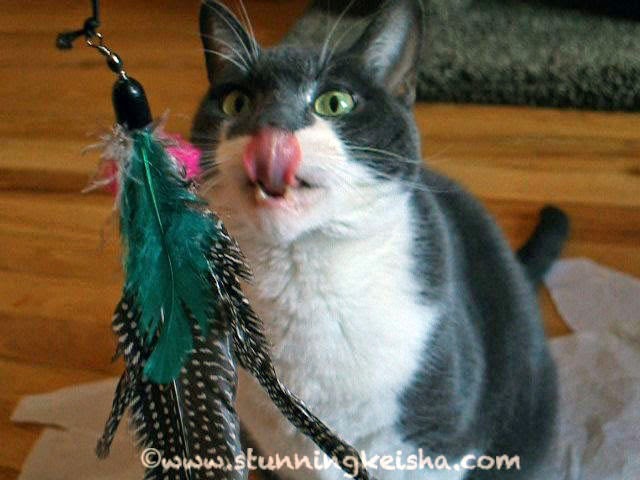 Truffles is sleek, svelte, and sassy :) As I've said before, you write the most creative and informative blog posts, CK! Great post! Flabby tabby! Ha!!!! Nice job of myth busting. Correct on all counts. Well done. Wow 90% increase...that is not good. I sure don't want my kitties being laughed at and bullied. It's our responsibility to keep our fur babies fit and healthy. Great post in raising awareness! Flabby tabby?!?! Great info CK!!! Yep, if the humans would just make sure they are feeding us quality food AND in the proper amount, there should not be any flabby tabbies! It's very true that we humans (cough cough me) tend to look to answer all ills with food. But doing it to the point of obesity is not good. Super good post CK. This is the first diet for a pet that M has ever run across that actually works. As you know, I've lost some weight on this plan and am still working on it. We're taking it slow so the weight stays off. And even tho some days I think I might be hungry, I'm not. Next meal comes along and I don't want to eat much. I don't know why all pet parents don't get their pet on this diet if they have a pound or two extra on their body. Cat obesity is serious stuff. Way to cover this very important topic and keep it real, CK! Prince and I are both on diets. We gained the weight together so we are walking and lowering portions together. At first I cut out all treats but he has lost 14 pounds and only has about 6 more to go, so we are giving tasty but diet concious treats now. I hope people heed what you say because it is much easier to maintain weight than lose it. Great post on a very important subject! I'm not a cat lover, rather a dog lover but the same applies to both as it does to humans. Proper diet and exercise will keep the weight in check. I think its more cruel to let them become obese and then put them on a strict diet -you may know why but your pet doesn't. My mom-person is playing with me with the wandtoy and she throw´s mousies and balls in the air too efurryday ! I have never thought about animals getting overweight. Pets normally can overweight as they are look after carefully by humans , I see a lot of cats everyday , everywhere here in Saudi Arabia , some are fat and some very weak. But I feel that there is a need for sensible feeding to pets to aviod problems.